…will add a whole new dimension to your body weight and core strength workouts. This is a great company making very high quality equipment. You can set up your TRX trainer just about anywhere you happen to be. The equipment is light and fits in a small stuff sack, but this gear is rugged and the workouts are heavy duty. TRX has spent a great deal of time and effort developing targeted specific exercise programs and their excellent routines are available as “TRX TV” or on DVD. Ships Free. Comes With 30-Day/100% Satisfaction Guarantee. Elbow pain is a common problem for climbers, throwers, tennis players and many others. A common therapy which can help with some elbow problems is to hold a hammer or similar object in your hand, with your arm at your side and your elbow flexed forward at 90°. The elbow is then rotated inward (pronated) and outward (supinated) through it’s range of motion resisting the weight of the hammer. The shortcoming of this simple idea is that the rotational force, torque, created by the hammer increases as the head moves out to one side or the other. When the hammer’s handle points straight up there is no torque, only weight. But you can easily make this neat device, which keeps the torque equal through the movement, and allows for easily setting the desired weight. You’ll need a piece of PVC pipe big enough to get your fist inside. Mine is 4” inner diameter. The handle is 1” PVC held in place with end caps. 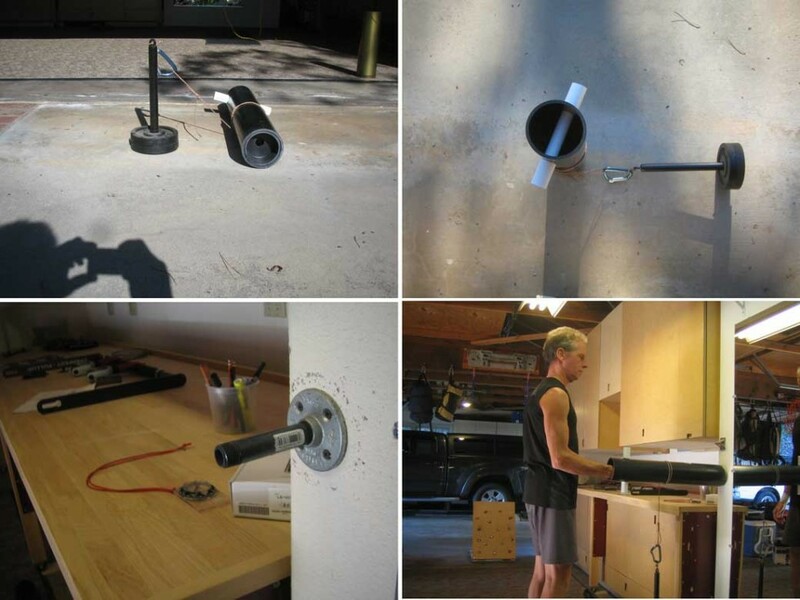 The 1” hole can be drilled by hand, the PVC is easy to drill and cut. The end opposite the handle needs an end plug with a centered 1” hole. Mount a pipe flange and a 4” length of ¾” pipe on the wall at elbow height as shown above (if you’re going to use this with various people you either want to figure a way to make the height adjustable, or just mount flanges at various heights.) Drill a small hole in the center of the main tube and attach a length of cord. I got the weight carrier at Big Five, everything else at Home Depot.